Another recent project completed in November 2017 for Seco South was the SPC Marine Science Center in Bay Pines, FL. The unique design was created by Rowe Architects and Seco South was contracted by Biltmore Construction to perform the work. This project consisted of the design, fabrication and installation of 550 linear ft of our stainless steel cable handrail system SP1-2000. The material used to combat the salty conditions near the intracoastal waterway was a marine-grade Type 316 stainless steel with a finely brushed finish on the material. A 3/16" diameter stainless steel cable system was used as the railing infill system to provide a marine aesthetic while maximizing views and allowing adequate wind flow. In addition to the stainless steel railing, we also provided our SL1-2000 aluminum railing for the rooftop mechanical equipment and we even manufactured a custom aluminum dumpster gate. The biggest challenge we faced was designing, fabricating and installing the perforated aluminum sun screens required by Rowe Architects to help control the ambient temperature of the building. 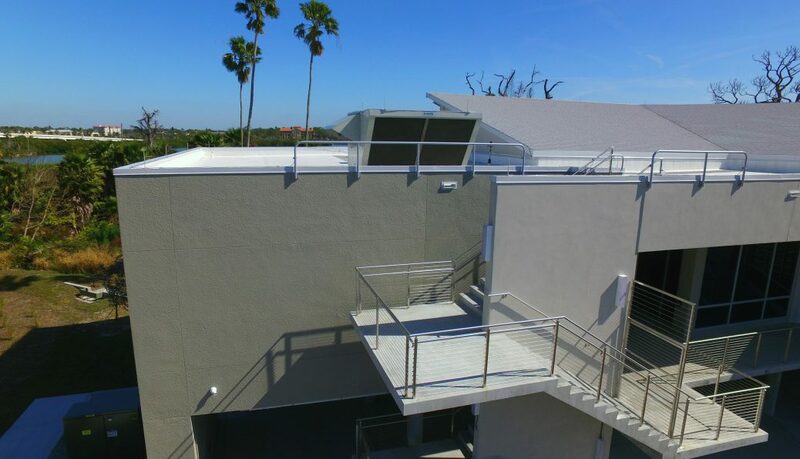 These aluminum sun screens were installed directly to the steel super structure of the building using proprietary methods for keeping dissimilar metals from reacting with each other. The final finish on the sun screens was a marine grade powder coated surface.